Watch our 3-minute video to help you quickly activate your child's Apple device! Step 1 - Note the activation code displayed on the screen. 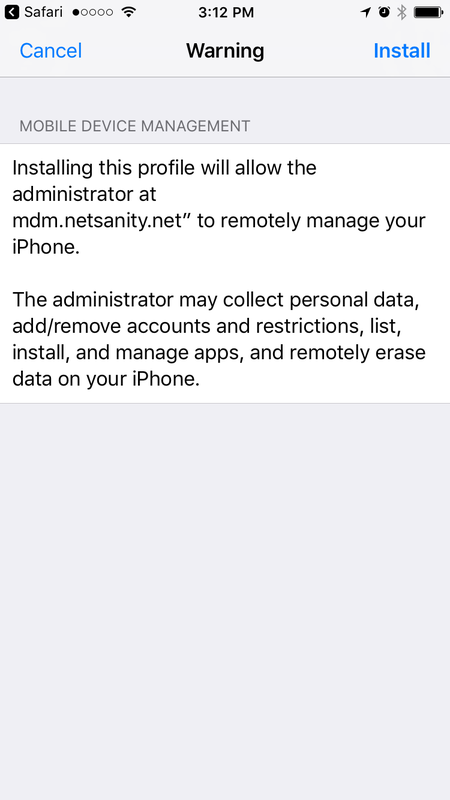 Step 2 - Open the Safari browser on the device you wish to protect, and enter [https://e.netsanity.net] in the address bar. Enter the enrollment code from displayed on the screen. Step 3 - You will be prompted to Install Profile, click the install link on the upper right hand side. Step 4 - You will be prompted for the passcode on the device if one is set. Enter the device passcode. This is the passcode you would use to unlock the screen. Step 6 - You will be prompted to accept "MOBILE DEVICE MANAGEMENT" this allows our service to manage your device. Click install. Step 7 - You will be asked if you trust our service for Remote Management, click Trust. Step 8 - You should be notified that the profile was installed. Click Done. Step 9 - You should be returned to the Safari browser, and see a success notification, indicating you are now enrolled in the service. You may now close the Safari browser.